The “place making” (oy) plans for Pike-Pine got underway two years ago, and finally there’s some news: On Tuesday night, January 17, the Downtown Seattle Association and the city’s Office of the Waterfront held an open house at the ACT Theater at 8th and Union to finally present some blueprints for the $20 million pedestrian super upgrade. Dubbed the “Pike-Pine Renaissance Act 1,” the idea is to use friendlier, expanded sidewalks that slope into shorter (calmer) intersections, green street canopy, plenty of seating (both fixed street furniture and freestanding chairs), pop-up retail along the way, and better lighting to create a pedestrian expanse between the waterfront and Capitol Hill—or at least as far as Melrose, two blocks east of Boren above I-5. The project, slated to begin construction in 2019 with a 2022 debut date, is one element of the planned $709 million waterfront redesign, which is supposed to come with a (controversial) $200 million Local Improvement District, or LID. The people who showed up to the open house were asked to write comments on sticky notes. And they seemed encouraged by the pedestrian possibilities. “Could we do something like Bell Street? Wider sidewalks? Slow down the traffic?,” someone scrawled on one pink sticky note, referring to the mixed-use design on Bell Street between 2nd and 5th. “Keep the trees on 1rst. More trees!” said another. The simplest, but perhaps most dramatic change, was the idea of activating the whole corridor at night. I think the difference between businesses that are open during the day and during the night can have a dramatic effect on the action. While city planners use all sorts of data to determine the vitality of a neighborhood—rents, vacancy, density, parking, peds per hour, crime stats—they should also use time, AM to PM, as a metric to gauge a neighborhood’s success. Thinking about the 24-7 nature of a district is another way of thinking about mixed-use versus single-use districts. 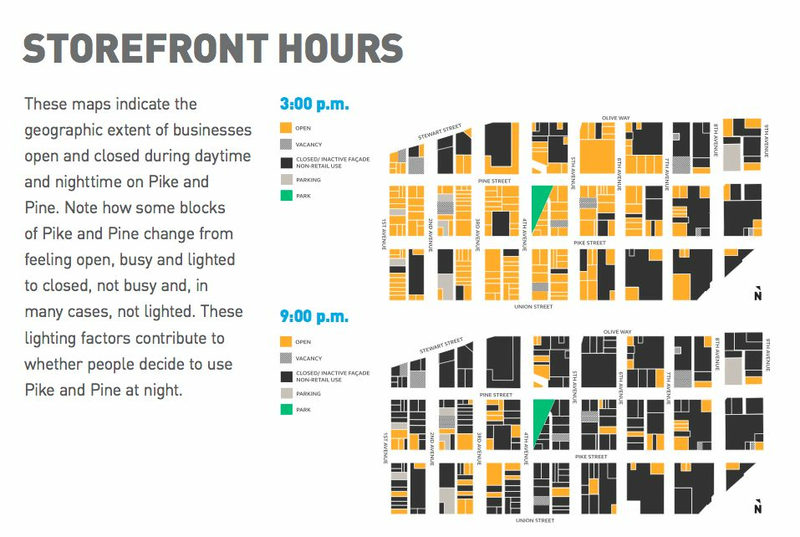 While Pike St. & Pine St. in downtown Seattle seem like vibrant mixed use blocks, they actually aren’t; just like residential neighborhoods, they shut down at night. As the planners move forward on this project, they should grab onto an element they’ve simply defined as “Lighting” and use it to guide them toward a more enlightened approach about the use of public space.